Several years ago, I discovered (as many others have) that it's not so hard to solder surface-mount components by hand. Even small (0603) components and fine pitch (0.5mm) connectors can be done with a soldering iron with an appropriately small tip. There are a couple of key items for small-component soldering: a small pair of tweezers and a microscope. Some friends convinced me that I just had to have a microscope, and they were right! I got an AmScope "7x-45x Stereo Zoom Boom Microscope + Ring Light" from an eBay seller. 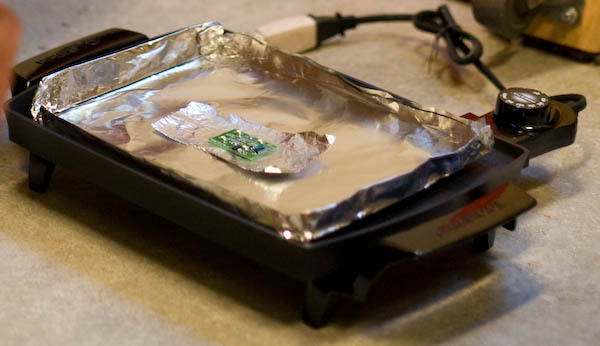 Meanwhile, there's been a growing trend for hobbyists to solder surface-mount components using solder paste and a toaster oven or skillet. Until recently, I'd never been compelled since hand-soldering has always worked fine for me. But, I had a couple of components that didn't have exposed contacts, and then got to a point where I wanted to get components off of a board. So, I decided to try "skillet soldering." Many sources indicate that a skillet or hot plate works better than a toaster oven. I considered various options -- hot plates, skillets, and griddles. All of these were items that would plug in to a regular 120V outlet and would produce heat on a flat, solid, metal surface. I looked at user reviews to evaluate things like heat and cool time and evenness of heating. Based on that information, I decided that the Presto 07211 Liddle Griddle looked like my best bet. There were less expensive options, but reviews indicated that heating and cooling could take a long time. I also figured that a griddle was more likely to have even heat levels across the surface. I tested the evenness of the heat on the griddle by making blueberry pancakes (yum!). The griddle cooked fairly evenly -- as expected, areas near the heating element (which is nicely visible from the bottom) cooked a tad faster than the off-element areas, but it was a small effect. It also maintained temperature very nicely, and it heated and cooled fairly quickly. Update: I've more recently been using stencils to apply solder paste. They can be cut with a lasercutter or even a simple cutting plotter. In about five minutes, the solder started to melt. Larger components took a little longer, probably less than a minute more, though. At that point I turned off the griddle. A couple minutes later, the solder had cooled enough that I could remove the board (with tweezers) without risking parts sliding off. This is the board before heating. Note the solder paste blobs, e.g. on the LED at the top. This is the board partially done, after heating for about 5 minutes. 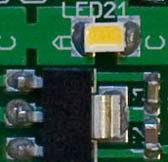 Note that the solder on the LED pads is shiny and has started to melt. The solder on the three pads on the lower left (voltage regulator) has not melted. This is the board once all the solder has melted, just moments after the previous picture. 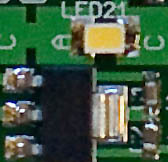 Note that the solder on the LEDs has flowed evenly onto the pads, and that the solder on the voltage regulator is also melted now. 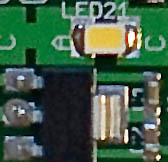 For size reference: in the photos above, the LED is PLCC-2, the voltage regulator is SOT-223, and the capacitors on the right are 0603.